The pens fir perfectly in your hand. Since I’ve got pretty big hands I prefer the pen III. I added an Edding (sharpie) to the pens for reference. I – The pen has leaked all over the package when I received it. The cap popped off – it’s held in place pretty looseley and forced the flux back into the pen.So be warned: when ordering this you might receive a wet parcel 😉 The flux output is minimal. Way too less to solder comfortably. You have to dab the pen multiple times to get enough flux to solder with. II – This pen comes empty. You have to disassemble it and fill it with your own flux. Filling it is easy tough, even for my clumsy hands. However this pen outputs even less flux than pen I! To re-wetten the tip you have to speeze the hole pen. III – This one is bulky. The output of the tip is just perfect. Dabbing the solder joints just once is enough tow ork with. But beware – be sure to shelf this with the tip pointing upwards! If you don’t the pen will prabably leak. It’s tip is really wet! Before the first use you have to push the tip into the inside of the pen. That’s probably to prevent leaking while shipping. I think the idea of a refillable pen is pretty awesome. 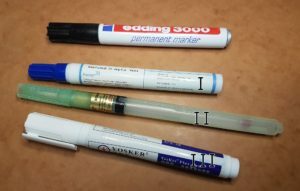 That way you don’t have to throw away empty pens and can use your preferred solder flux. Unfortunatly though the pens output is too less. Same is true for pen I. The flux in pen I and pen III seems to be the same. It smells the same, looks the same and does the same job. So come to an end – I recommend pen III. Feeling good in your hand, outputs just the right amount of solder and does the job. This entry was posted in General on 3. June 2017 by jensma.